Getting married at the Bull Hotel, Gerrards Cross, and looking for a pianist? Simon Jordan is a locally based piano player, teaching piano at a school in the town, and is a highly experienced wedding and events pianist. All the communication about your function you need – music played over Skype or FaceTime in advance of your ceremony or reception so you can double-check it works for you! For a long time, the Bull Hotel has been one of the leading wedding venues in the South Buckinghamshire area, and the attraction of a 17th-century coaching inn brings many visitors to Gerrards Cross. This beautiful hotel has a historic character. Now it comes coupled with four-star bedrooms, award-winning cooking and some sympathetic contemporary design. The Bull Hotel has four generously proportioned suites, all of which are licensed for civil ceremonies. The hotel can hold up to 130 guests for your civil ceremony, in a contemporary and yet classic setting. Your drinks reception, canapés or light buffet can be presented in the hotel’s leafy landscaped surroundings, and up to 220 people can partake in your wedding breakfast in a beautiful, mood-lit room. The hotel’s beautiful landscapes and gardens give a mesmerising backdrop for your wedding photographs, as the hotel staff serve up canapés on silver trays. For more information about weddings and the hotel itself, speak to the Bull’s dedicated wedding coordinators and event managers. Together, they will guide you through every part of the planning process. 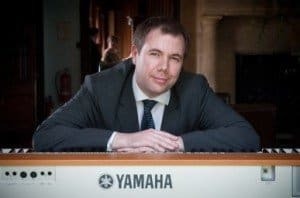 Then prepare your choice of music for pianist Simon Jordan to play – either on a piano at the venue, or with him bringing one of his selection of Yamaha stage pianos.